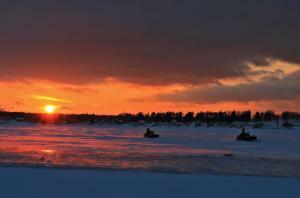 Once the lake freezes over, tents start to appear on the lake – a sign that the ice fishermen are here. 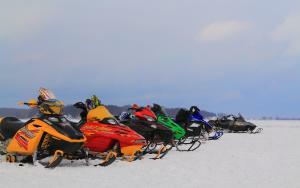 Then in early February, there are the infamous “Ice Drags”, sponsored by Little Sodus Inn -- where snowmobilers come from all over to see who will be “King of the Lake”. 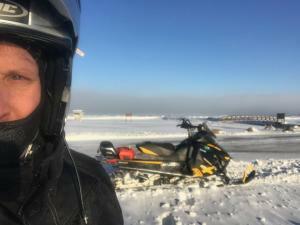 Speaking of snowmobiling, there is a great trail that runs from Cato to Fair Haven and all the way to Lake Ontario. The trail runs right by Turner’s 1816 House B&B– open year-round- and it is easy to get from the trail to our restaurants in the village. We also now have ice skating in the village – a rink has been created in the village pavilion, with lighting so you can even skate at night. And there’s no charge to enter – just bring your own skates! The Fair Haven Beach State Park is open throughout the year and is a great place for winter hikes, as is the Sterling Nature Center. 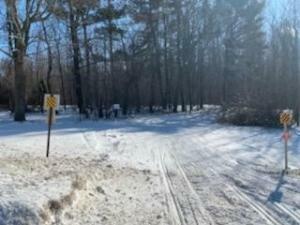 The Sterling Nature Center has 10 miles of trails (2 which run right along the lake) and even has snowshoes available for your use. The SNC also offers guided walks and winter themed nature talks and walks – like the “Owl Prowl”. In the village of Fair Haven we have several restaurants & pubs open through the winter that are accessible right from the snowmobile trail - Hardware Café (open everyday), Brandon’s Pub, Sterling Cidery - and along the bay we have Little Sodus Inn, Colloca’s Winery and Turtle Cove’s restaurant that are also open through the winter. Start out the day at the eclectic Hardware Café & General Store – which in addition to delicious breakfasts offers unique items for the shopper in your group. After a day outside in the cold, you can enjoy a nice glass of wine at Colloca’s winery or stop at one of our pubs which often feature live music. There’s something for everyone – and lots of places to “warm up”! 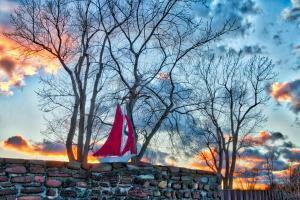 In February of each year (this year February 16) Fair Haven has hosted a Winterfest. This festival, sponsored by the Fair Haven Chamber of Commerce, originated years ago and was originally held at the Fair Haven Beach State Park. 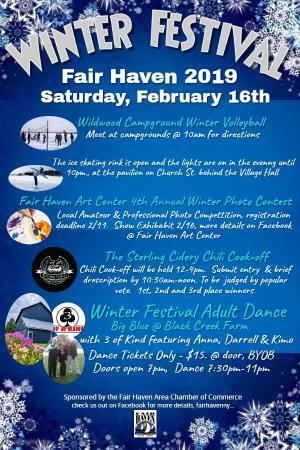 The event has been evolving over the past few years and now includes winter activities throughout the village -Ice skating at the Village pavilion, winter volleyball at Wildwood campground, chili cook-off at the Sterling Cidery and a Winter photo contest at the Fair Haven Arts Center. It culminates with a progressive dinner and dance in the evening. This year the progressive dinner runs from 4-8 pm and makes a stop at each of five restaurants - Brandon’s pub, the Village Grill, the Hardware Café, Colloca’s Winery and Turtle Cove – winding up with the dance at Black Creek farm’s Big Blue Barn. The dinner & dance sold out early last year, so get your tickets now at the Fair Haven chamber facebook site!